At the invitation of the government of the United Arab Emirates, Special Envoy of President Xi Jinping and Minister of Science and Technology Wang Zhigang will travel to the UAE to attend relevant activities of the 7th World Government Summit on February 10. Q: The conference of the five nuclear-weapon states in Beijing has caught much attention. Could you provide some information? Is China satisfied with the outcome of the conference? A: The conference of the five nuclear-weapon states was concluded successfully in Beijing. China has issued a press release on it. Here I would like to highlight the three important consensus reached at the meeting. First, the five states pledged their shared responsibility to world peace and security. Recognizing the severe challenges to the current international security environment and the vital role of maintaining sound major country relations in resolving strategic global issues, the five countries agreed to objectively view each other's strategic intentions, enhance exchanges in nuclear policies and strategies, strengthen strategic mutual trust and safeguard common security. Second, the five states pledged to jointly uphold the NPT mechanism. They emphasized that the NPT is the cornerstone of the international nuclear non-proliferation regime and an important component of the international security architecture. They committed themselves to fully implementing the NPT in its entirety, progressively achieving the goal of a nuclear-weapon free world, doing their utmost to resolve the nuclear non-proliferation issue through political and diplomatic means, and promoting international cooperation in peaceful uses of nuclear energy. Third, the five states pledged to continue to make full use of their cooperation platform to maintain dialogue and coordination. They agreed to maintain strategic dialogue and strengthen coordination in the NPT review process for a successful 2020 review conference. 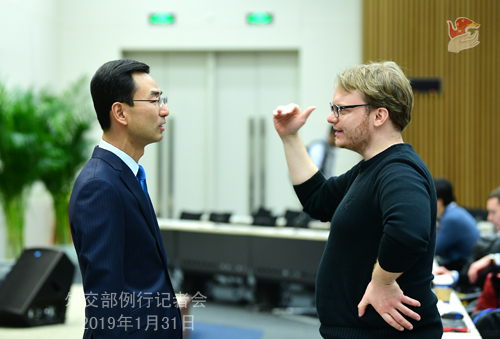 The five countries will also actively promote open and constructive dialogues within the international community, such as the dialogue session held this morning in Beijing with international academic institutions, media and embassy officials from some non-nuclear states. Against the background of rising instability and uncertainty in the international security landscape, major country relations and responsibilities of major countries are receiving more and more attention. The five states, in sitting down for face-to-face exchanges and in-depth discussions of urgent issues related to strategic security and reaching the above-mentioned consensus, demonstrated a positive attitude in dealing with international security challenges through coordination and cooperation. It will help enhance the international community's confidence in the international security environment. The positive outcomes were acclaimed by all parties to the meeting. As the rotating coordinator for the cooperation mechanism of the five nuclear-weapon states, China will continue its efforts to help build consensus and manage differences among the five countries and replace major power competition with coordination and zero-sum game with win-win cooperation, to contribute to world peace and stability. Q: Russian Foreign Minister Sergey Lavrov said that Moscow wants to create conditions for dialogue between the Venezuelan government and the opposition and is holding talks with Venezuela, China, some Latin American and European countries in this regard. I wonder if you can confirm China is open to such a dialogue and willing to engage in mediation efforts? A: Regarding the situation in Venezuela, China has stated its position many times, so I am not going to elaborate on it today. I would like to stress here that the Chinese side has for many times called on all parties to find a political solution to the Venezuelan issue at an early date through peaceful dialogues. This is also an outcome that all parties want to see. China stands ready to work with all parties towards this end. Q: We learned that an official from the Japanese Foreign Ministry will be visiting China soon. Can you confirm that and give us more details? A: As agreed by the Chinese and Japanese sides, Vice Foreign Minister Kong Xuanyou will hold the 16th China-Japan Security Dialogue and the 28th regular consultation between the Chinese and Japanese Foreign Ministries with visiting Japanese Senior Deputy Minister for Foreign Affairs Takeo Mori on February 1. The two sides will have an extensive and in-depth exchange of views on China-Japan relations, national defense and security policies of the two countries and international and regional issues of mutual interest. Q: Will the Beijing P5 Conference issue a joint statement today? A: As the host of this conference, the Chinese side has already made conclusion remarks yesterday to brief on relevant details. You can find them on the website of the Foreign Ministry. Q: Yesterday you outlined China's stand on the NPT, and today about the P5 Conference you said that the NPT mechanism will be upheld. So was there any discussion related to the application of India to join the NPT? And was there any discussion about non-NPT members being given preference based on their record of non-proliferation? A: Like I just said, the five nuclear-weapon states pledged to jointly uphold the NPT mechanism. They emphasized that the NPT is the cornerstone of the international nuclear non-proliferation regime and an important component of the international security architecture. They committed themselves to fully implementing the NPT in its entirety, progressively achieving the goal of a nuclear-weapon free world, doing their utmost to resolve the nuclear non-proliferation issue through political and diplomatic means, and promoting international cooperation in peaceful uses of nuclear energy. You asked about accession to the NPT, China's position is that we call on non-NPT countries to join the treaty as non-nuclear weapon states as soon as possible. Q: Vice Chairman of the Senate Select Committee on Intelligence Sen. Mark R. Warner recently said that the relevant actions by China's large-scale technological companies have been a cause for concern. They have been obtaining and replicating sensitive technologies with the help of the Chinese government. Also on the same day, US Senate Minority Leader Chuck Schumer said that China wants to replace the US as the world's leading tech power and has been stealing for that end. What is your response? A: I have noted relevant reports. In science and technology, the US is second to none. This is a fact we recognize. But we also hope that the US can accomodate other countries' technological development and progress with an open and inclusive attitude. There is no justification at all for the US to applaud its own progress in science and technology and have little tolerance for the development of others. Willful denigration, criticism and suppression of other countries' progress is simply unreasonable. I want to stress that China has not achieved its technological development through theft or robbery. instead, it is with the wisdom and hard work of all the Chinese people including Chinese scientists. Competition is one of the basic features of market economy. You cannot have market economy without having competition. The US talks about market economy all the time and demands other countries to observe the rules of market economy. Therefore, there are more reasons for the US to view and approach the subject of competition in an objective and correct way. It is absolutely normal for China and the US to have competition in the technological field. As long as such competition is legitimate, fair and rules-based, it will boost the technological development of not only the two countries but also all mankind. 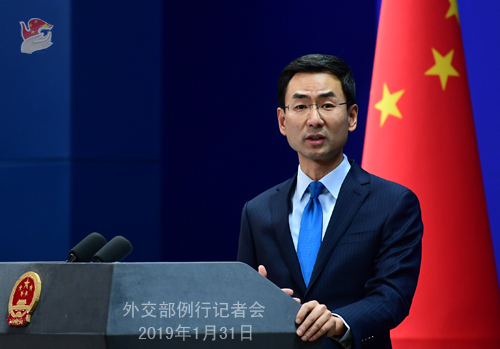 China stands ready to strengthen exchange and cooperation in science and technology with the US to better serve the two peoples and people around the world. On this front, China's attitude is always open and inclusive. Q: Again, to follow up on the P5 discussions on the NPT. 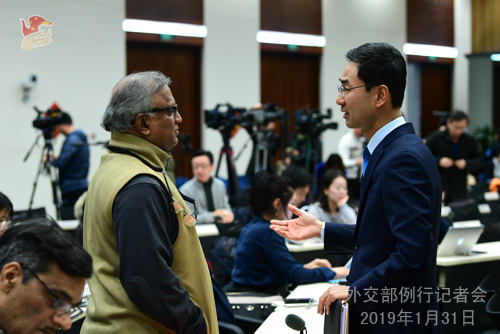 Regarding China's position on the entry of India into the Nuclear Suppliers' Group, China suggested a two-step approach for relevant countries to come to an agreement. Now you seemed to suggest that non-NPT members have to necessarily sign the treaty to enter the NSG. Is there a change in China's stand? Or do you still stick to the two-step approach? A: I don't want to cause any misunderstanding. China's position on the relevant issue has not changed. What I just said is that we call on non-NPT countries to join the treaty as non-nuclear weapon states as soon as possible. This is our consistent position. As for India's application to join the NSG, our position on that has not changed either. Follow-up: What should a country like India do to join the NSG, despite the fact that they have overwhelming support from the NSG and outside? Is China still adhering to the two-step approach? A: We call on non-NPT countries to join the treaty as non-nuclear weapon states as soon as possible. This is our consistent position. As for India's application to join the NSG, we have said before that there is no precedent for a non-NPT country applying to join the NSG. Therefore, we maintain that the NSG members should have consultations with plenty of patience and seek to resolve this issue based on consensus. The Chinese Lunar New Year is just around the corner. Many compatriots will choose to travel abroad during this festival. Travel safety should be on the top of everybody's mind, second to none. Our advice to Chinese citizens who plan to travel abroad is to raise awareness to guard against risks, carefully study the border entry and exit rules of their destinations, select traveling programs with caution, properly arrange their traveling itinerary, and never miss any details safety-wise. I also want to remind our compatriots to learn and abide by local laws and regulations, respect local customs and practices, travel green and travel with good etiquette, to project and maintain a good image of Chinese tourists. Meanwhile, I advise you to follow safety notices and information published by China's Consular Affairs website (http://cs.mfa.gov.cn), the WeChat version of 12308, the "China Consular Affairs" account on Weibo, and the 12308 smartphone app. In case of emergency, please contact local police immediately, and also dial +86-10-12308 or reach out to our diplomatic missions there. 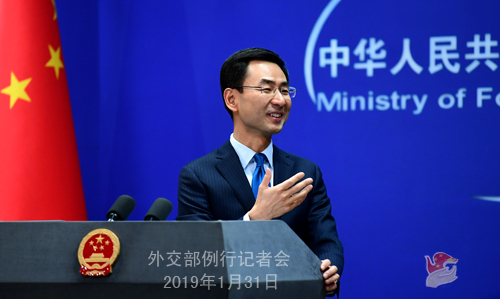 The Foreign Ministry and China's diplomatic missions overseas will continue to coordinate with local authorities to ensure that concrete and effective measures are taken to ensure the safety of Chinese citizens.